A group has teamed up with a local police association to help kids at Rhinelander schools who are being bullied. 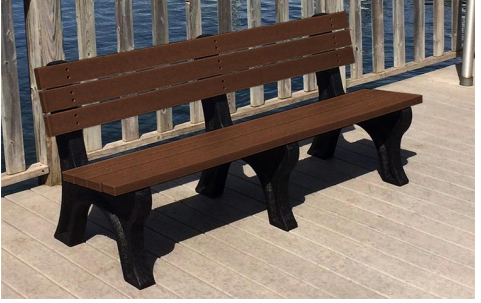 Rhinelander Parents Against Bullying in cooperation with the Rhinelander Professional Police Association are fundraising for Buddy Benches for Crescent, Pelican, Central Intermediate, James Williams Middle School and NCES schools. Ashle Smith founded Rhinelander Parents Against Bullying. "...I did some research on bullying and other school districts across the country have them and were successful in decreasing bullying, so I reached out in my group and Sgt. (Kurt) Helke, who is with the Rhinelander Police Department and the Rhinelander Professional Police Association, he offered to be our fiduciary agent to receive our funds and put some weight behind this...."
Ashlei Smith says the benches are installed outside near the playgrounds..
"My hope is that there will be children who will volunteer to be buddies and they will keep an eye on the bench. If someone is having a bad day or they're feeling alone or they don't have someone to play with, they can sit on the bench and they will be engaged by a peer. Whether that's just talking to them, or getting them off the bench, that is the goal...."
She says research has found that a person is less likely to be bullied if they have someone with them. She says people who become bullies often feel alienated and alone. She says young people often don't want to talk to adults, they would prefer to talk to a sympathetic peer. Smith says a local Girl Scout Troop is building a bench as one of their projects. Donations are being sent to the attention of Sergeant Kurt Helke, Rhinelander Police Department. They ask you to put a memo on your payment as 'Buddy Bunch Fund'. All checks payable to RPPA or Rhinelander Professional Police Association.